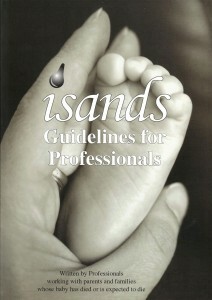 In 1995 ISANDS (A Little Lifetime Foundation) embarked on a project of compiling a book for Professionals written by Professionals. It was a daunting task as there was little or nothing to base a book of this type on. We brought together various groups of Professionals and discussed the possibilities and what direction it might take. We decided, rather than writing a book to cover the whole are of care and bereavements under one heading that we would break it up into different sections under relevant Professionals, ie Obstetricians, Paediatricians, Midwives/Nurses, G.Ps, Pastrol Care within the Hospital and the Community and Teachers. Originally we met with various groups of Professionals to come up with a frame work to approach this sad but difficult subject. In open, frank and honest discussions we were able to recognise that for the Professionals, it is extremely difficult to break the sad news to any parent that their baby has died or is expected to die. In A Little Lifetime Foundation’s opinion, depending on how that is done can affect parents and has a bearing on how they will cope in the immediate time and afterwards. So that was the base line for this book- how do be marry those two areas -being able to communicate sad news and how that can affect everything else that happens. What helps and what makes a difference -A Little Lifetime Foundation have 25 years of experience on this bit. From our Parent Support Group meetings and Support Team Supervision meetings we were able to piece together important reoccurring patterns that ‘made a difference’ in a good or bad way. What needs to happen, what needs to be said, what needs to be done and HOW in all these situations. So everyone went away and wrote individual pieces on how they envisaged this would happen. Then each section was discussed in great detail with the various groups, then after hundreds of meetings, telephone conversations, letters and emails a draft document emerged for most sections !! (others were added later). Now to be honest with time constraints for everyone involved it was hard to keep everyone motivated and interest waned from time to time. Then about two years ago I decided it was time to get back to the Professional Book. I re-grouped everyone and serious business was done!! It was full steam ahead regardless!! We also had to get some new people involved as some Professionals had retired or moved out of the this area of care. We also recognised new areas that needed to be included and found good people to help us with that. Areas in the book referring to actual practice (not suggested best practice) and laws ie. Coroners Post Mortem, Religious and Cultural Belief, Funeral Directors, Teachers were contributed by ie. Coroner, and various Cultural Groups, Teachers etc. Matters referring to anything medical was contributed by the various Professionals in their field of expertise. Hours of conversations, typing and formatting were spent, a full document was produced before the Book went to print and sent out to over 300 Professionals and to various Schools and Colleges to include Royal College of Surgeons School of Nursing-Trinity College, School of Chaplain Clinical Pastoral Care, Archdiocese of Dublin, and St. Patrick’s Teacher Training College to name a few, for their comments, suggestions criticisms. We had almost a 100% response, which was incredible, which leads me to believe that the climate is now right for a publication such as this. In general there was great feedback and encouragement about the draft and the necessity for a publication of this sort. Our thanks to everyone who took the time to read through the draft and make useful and insightful comments. difficult subject ‘user friendly’ and that is what we need it to be if it is to be effective. This book breaks new ground in all areas. There are no other publications which have been written in this manner anywhere. This publication came about because the climate was right and it being the right time for everyone to be open about this topic. We are eternally grateful to all the Professionals and others that were interested in being part of this publication. It was an incredible journey of searching and finding. Thank you for your willingness to share your experience, expertise, insight with us in a very honest, frank and compassionate way. Time will tell if it makes a difference and I believe it will, what we need to remember is that we need to see this publication as a ‘work in progress’. In time more changes will come about or new ways of looking at this whole are of care will happen and this book, we hope will move with those changes. Thank you to all the parents and families who were also part of this publication. You and your children’s short lives continues to make a difference. For me it has created yet another bookmark in my life and my journey. I am so very proud of my part and role in it and very grateful to have brought the project to fruition.